Despite Ameir’s love of Desi food and his abnormally (for an Arab) high spice tolerance, he can’t stand Desi desserts. Well, to be clear, he can’t stand ilaichi (cardamom), which is in almost every Desi dessert. So, Ameir often says that the best meals involve Desi food and Arab desserts. And, truth be told, I haven’t met an Arab dessert that I don’t like. (Although Rasmalaii will remain my favorite dessert of all time and I will learn to make it as well as Qamar Auntie, InshAllah). 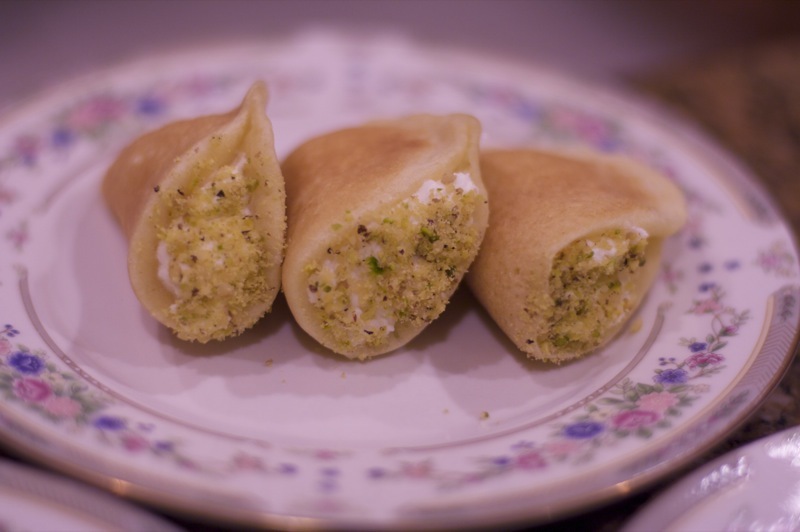 Atayef are elegant in their simplicity – small semolina pancakes filled with perfumed ricotta and pistachios. Since the pancakes and filling are not very sweet, a lot of honey-sweetness and flavor comes through, so it’s worth using a great honey here. I’d suggest an orange blossom, apple blossom, blueberry, or any other fruit flower based honey (see Grampa’s Gourmet Honey for a list of honeys and their flavors). Although, if you wanted to highlight the flavor of a particularly strong, dark honey, this would be the place for it! You could even substitute a strong honey for the orange blossom water in the ricotta. 1. Make the batter – In a stand mixer or food processor, mix all the dry ingredients together. Pour in the warm milk and blend until smooth. Let the batter rest for 30 minutes. 2. Cook the pancakes Preheat a wide non-stick pan or a griddle to medium to medium-high heat, as if you were making pancakes. Put some oil or melted butter on a paper towel and rub it around the pan to grease it very lightly. Pour in about two teaspoons of batter per pancake and let it spread naturally into a small circle. Cook the pancakes until bubbles appear on the surface and remain there, such that the pancake looks spongy. Remove from the pan and let the pancakes cool completely. 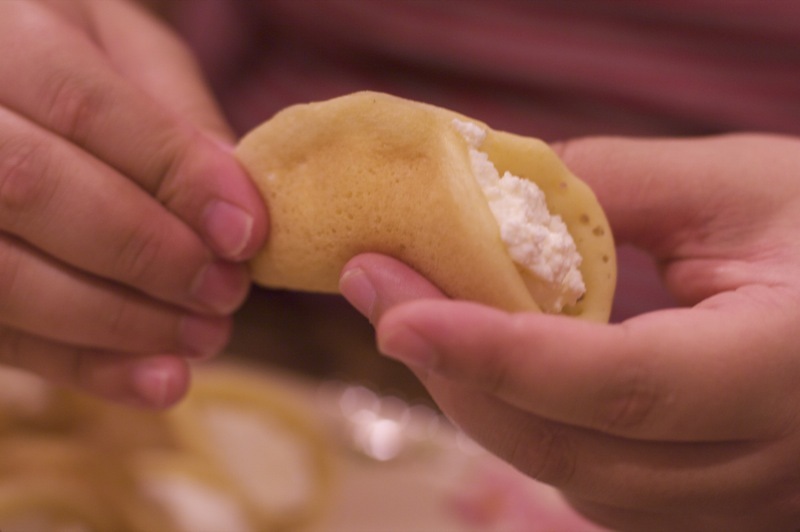 Atayef are cooked only on one side – the bottom is cooked through and is slightly golden brown, and the top remains soft so that it can be pinched together to seal. The whole pancake should remain very pliable. 3. Prepare the filling – Start with about two cups of ricotta, half a cup of coconut, and one or two teaspoons of orange blossom water. The orange blossom water is a common flavoring in Arab and Desi desserts, but it can be an acquired taste if you’re not used to it. 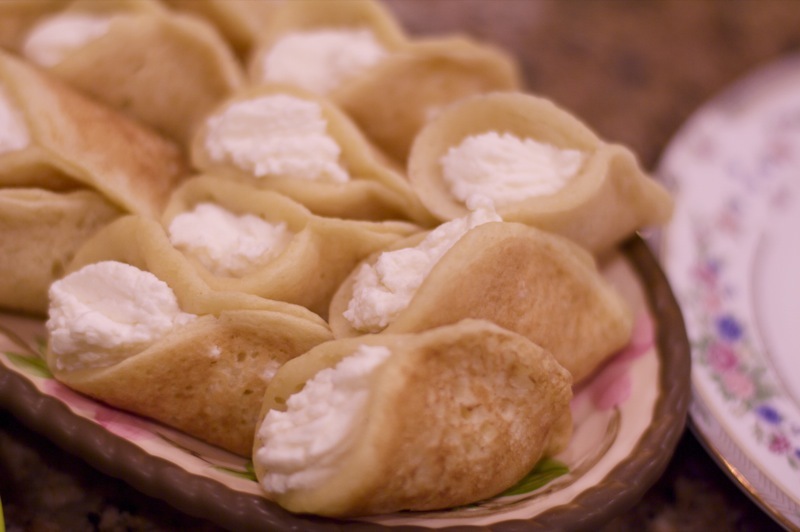 As for the sugar – it is to taste, but ideally atayef filling should not be overly sweet. About one tablespoon to two cups of ricotta is probably enough. 4. Fill the atayef [the pictures in Lightbox help understand this]- take each round pancake in the palm of your hand and put about a teaspoon of filling into it on the spongy/soft side. Try to place the filling all down the middle in a cone shape, such that one part is thinner and one part is thicker. 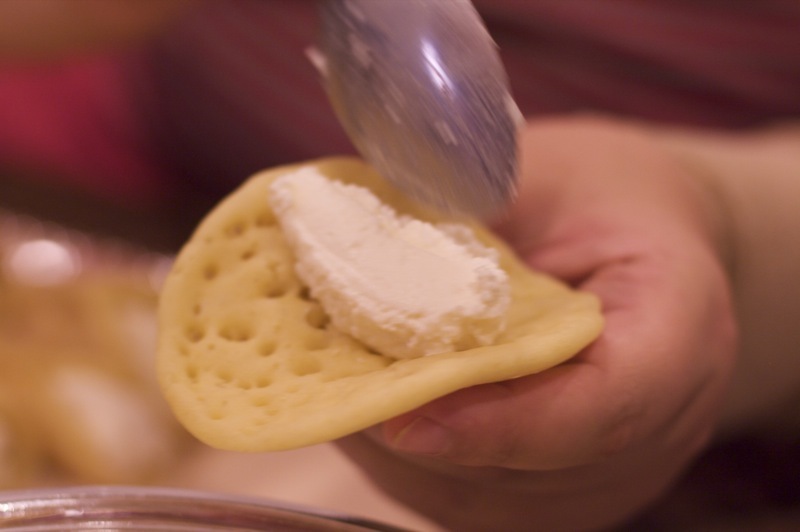 Starting from the thin side, pinch the pancake together at the top to seal. Seal it about half or three-fourths of the way – don’t close it all the way. 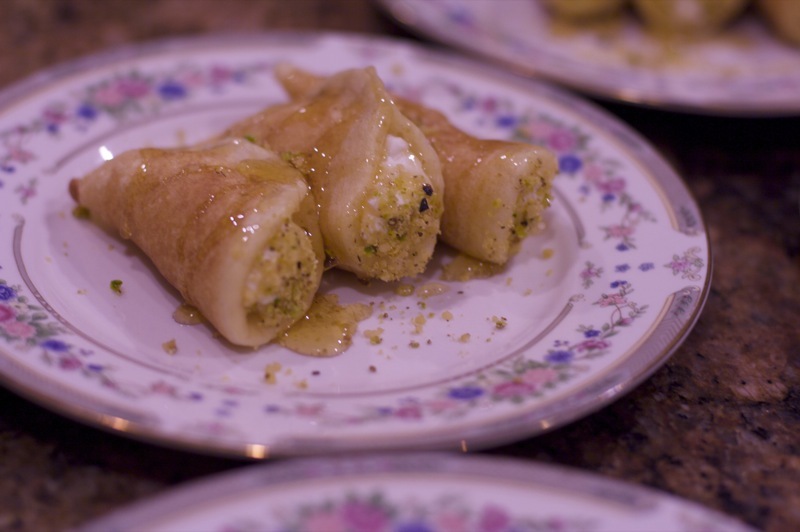 Some ricotta should be poking out of the atayef on the open side, like the cream would in a canoli. 5. 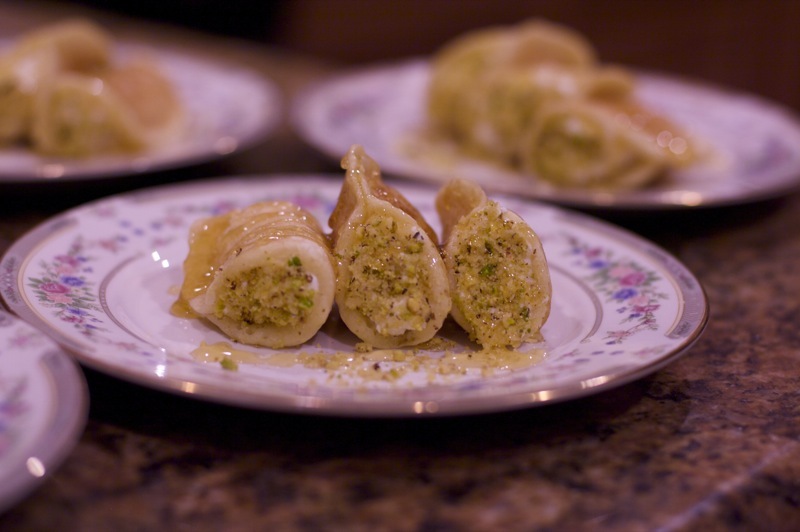 Garnish the atayef – Place the finely chopped pistachios into a shallow bowl or plate. Carefully dip the exposed ricotta into the pistachios and place it on a serving platter. Drizzle the atayef with honey. Serve with hot tea or coffee! Hi ! I love your blog and I’m happy that you are back. 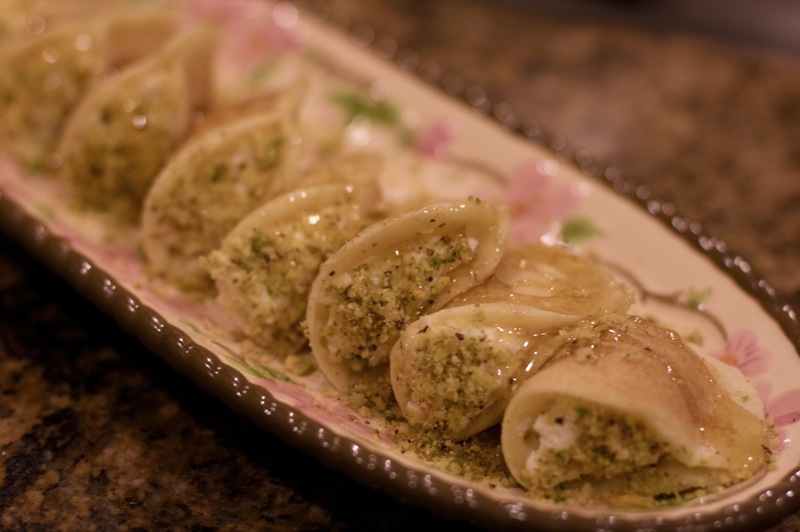 Your atayef look really yummy, beautiful pictures ! I would have made this today if I had ricotta cheese on hand. But sure bookmarking it! I like Arabic desserts but I’m pretty selective. They often tend to be sweeter than my liking but I know the homemade ones are not as sweet. 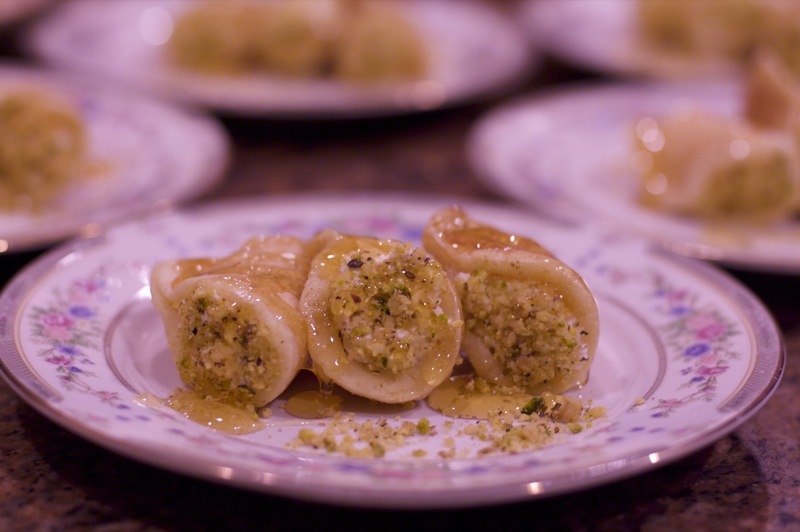 Kulsum, I hope you get to make Atayef soon. The sugar content can really be controlled. The way Fatimah makes it (this recipe is from her), the only major sweetness comes from the honey. The ricotta is very, very mild. Let me know how it goes if you decide to make it! I’ve never even heard of these before! Thanks for sharing. 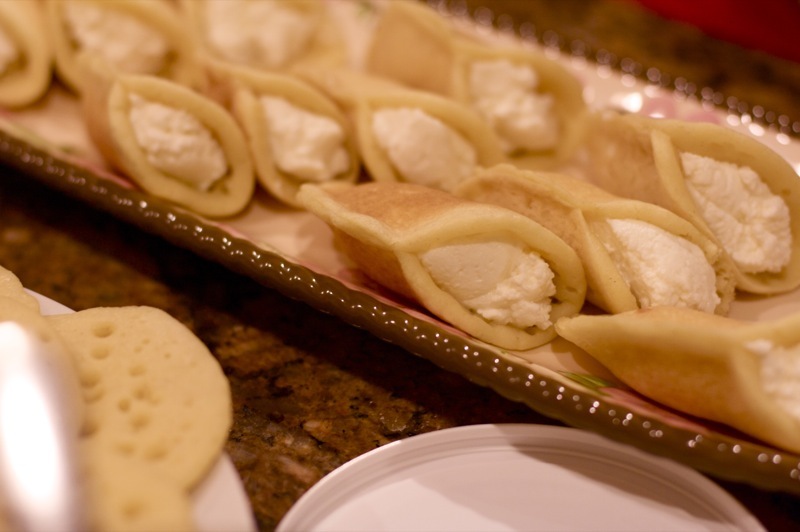 Because of how thin they are, and because you wrap ricotta cheese in them I think of crepes too. very attractive good looking dessert. since it is not requiring sugar I consider it as a very healthy dessert. 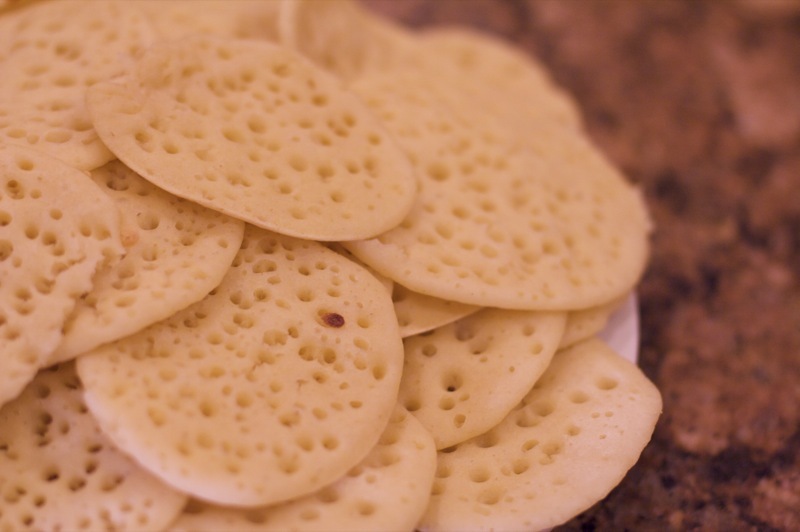 These were very tasty and such nice delicate little pancakes! We didn’t have the orange blossom water, so we put some ground mahleb (used to flavor some Middle Eastern baked goods) and nutmeg in with the ricotta cheese. I love that desert, it just melts in your mouth. I made some today with your recipe, but I had a bit of hard time with the pancake, it didn’t quite bubble as it should. It should be thin right?